First automated Potential Analysis for Small Wind Power. We find the perfect location for your Small Wind Turbine. Automated location analysis based on geodata. With Windarea we offer you a future-oriented, innovative and Europe-wide unique wind energy concept. For private or commercial use. Determination of the optimal location – Solving the location challenge. The biggest challenge in the field of small wind power is the selection of a suitable location for the turbine. The correct positioning is indispensable for economic efficiency, since the yield from a wind turbine increases in third power depending on the wind speed. WIND-AREA is the first tool for solving the location problem. The analysis on building and ground level enables the exact determination of local wind conditions. This shows in detail where turbulence occurs and which location is optimally suited on the basis of existing obstacles. 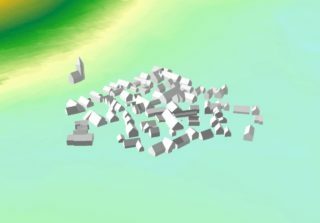 Wind flows and their behavior in the area of obstacles can be precisely modeled using WIND-AREA, thus determining the most economical locations for small wind turbines. 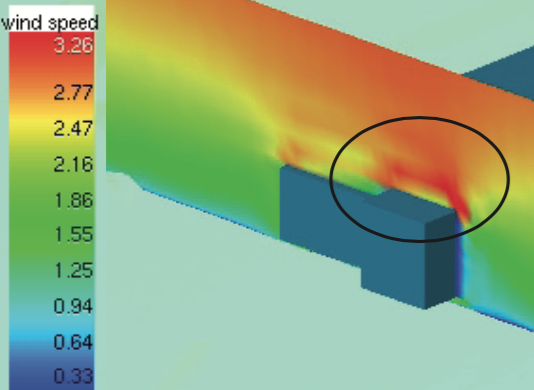 Costly test measurements can be narrowed down by WIND-AREA’s modeling to the locations indicated as particularly windward in the WIND-AREA simulation for small wind turbines. 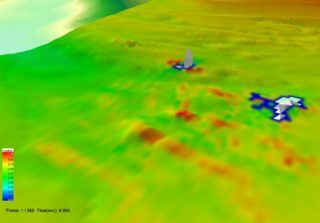 WIND-AREA is the first potential analysis especially for small wind turbines based on 3D-geodata. The method is based on the intersection of high-resolution laserscanner data with regional wind data applying tools of fluid mechanics. The result of WIND-AREA is graphical information showing the wind velocity in high resolution in certain height layers, e.g. from 1 m to 10 m above the terrain surface or obstacles / buildings. The potential cards show selective high currents on building roofs and other areas with high wind speeds. As data basis for the modeling of the 3D-surface high resolution laserscanner data of the State Office for Geoinformation and Land Development as well as wind data of the State Institute for the Environment, Measurements and Nature Conservation are used. For the construction of the 3D model also planning data, for example from a planning application, can be applied. Wind conditions in planning areas are strongly affected by the roughness of the soil as well as by orography defects (terrain relief). The location of each locality is given special consideration: height difference of the district, the prevailing winds due to the orography on the planning site, which are represented in a separate graph as a wind rose. On the basis of frequency distribution, these directions of flow are selected in the simulation (main wind direction) and the average wind speed distributed over the year is taken into account at a height of 10 m above ground. Results and objective of the analysis. A brief description of the circumstances that influence the maximum wind speed at a detailed building site. The expected average annual wind speed is stated at the most suitable location. In addition, the analysis includes a height profile of the wind speeds, as well as visual representations of the wind conditions to each building part. Furthermore, you get videos showing the wind flow conditions. Which building or which part of the building is best suited for small wind turbines? We are happy to send you an example analysis. WIND-AREA can be requested and ordered directly from 2Degrees. For more information about our wind turbines and the yield calculators, see here.